Are you a true-blue friend? Loyal to the end? Is your creed “all for one and one for all”? If these mottos describe you, it’s probably pretty difficult for you to let go of a friendship. Continuing some friendships in recovery only hurt you in the long run. In an effort to revive or repair a broken relationship, you may break yourself. To maintain healthy sobriety, you may have to end the friendship. 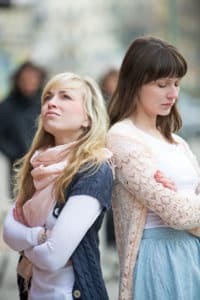 They don’t want you to change: If your friendship was forged over drug or alcohol use, your friend might not be too excited about your new sobriety. They don’t want to lose their “using buddy.” They don’t want you to get clean and “leave them behind.” If a friend encourages you to continue using, it’s time to run – not walk – the other way. These “friends” will drag you down faster than you can say sobriety. They are hyper-critical: Friends should be honest with each other. This means sharing honest opinions and being open about your feelings. It doesn’t mean criticizing everything you do. If you can’t do anything right in their eyes, they aren’t good for you. While in recovery, you need encouraging, supportive people to surround you and build you up. Someone who constantly tears you down has no healthy place in your life. They are known for negativity: You’re setting new goals. Trying new things. Making a new life for yourself in recovery. What do they have to say about it? Nothing good. Every time you share good news, they try to burst your bubble. When you start to feel hopeful, they bring you back down. No one needs this kind of negativity in their life, but especially not those recovering from addiction. They are self-absorbed users: Do you find you’re always the one who’s listening? The shoulder that always gets cried on? The one to loan money or a car? It’s important for friends to help one another, but it can’t be one-sided. If you’re constantly feeling used up and never poured into, it’s time to make a change. They don’t respect boundaries: To maintain your sobriety, you’ve probably established some new rules for yourself. A good friend will respect these boundaries. If they are constantly crossing them, they don’t have your best interests in mind. They invite you to a bar after you’ve told them that’s the one place you shouldn’t go. They bring people to your house that they know you shouldn’t be around. Whatever your personal boundaries, they should respect them. If they don’t, you need a new boundary – between you and them.